It is an established fact that AlaHadrat (Alaihir RaHma) gained proficiency in more that fifty branches of knowledge. With this, AlaHadrat (Alaihir RaHma) wrote many books on various aspects of Islam. AlaHadrat (Alaihir RaHma) was a genius writer. He wrote numerous books and treatises in Arabic, Persian, and Urdu on diversified topics. In 1887, at the age of 30 years, he had completed 75 books and treatises. In 1909, at the age of 43 years, this number increased up to 500. However, It has been estimated that the number of books written by AlaHadrat Imam Ahmad Rida Khan Alaihir raHmah exceed 1000 on more than 50 branches of Knowledge. Apart from these contributions, he had written annotations and commentaries on more than 150 books pertaining to various branches of learning. "Mawlana was a prolific writer. He wrote a large number of treatises. It is due to the fact that his head and heart had surging waves of knowledge which were hard to restrain." 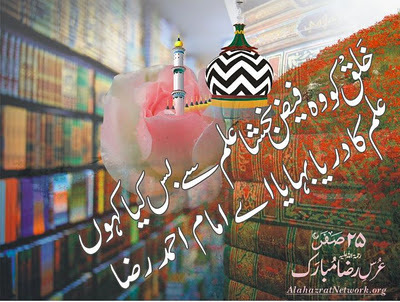 "The research works of Imam Ahmed Raza Khan are worth presenting. There is due need that Historical and Cultural Societies of India, Pakistan, Afghanistan and Iran together with other such institutions keep all his writings duly cataloged in their libraries." His Divinely bestowed intelligence was such, that when AlaHadrat (Alaihir RaHma) completed a quarter of any given book at the feet of a teacher, he used to study and memorize the remainder of the book by himself. It is recorded that he completed an Arabic commentary on the book, "Hidaayatun Nahw", on Arabic Syntax, when he was only 8 years old! 37 of ibn abidin's 'books' which are rasayil are collected in two average sized volumes named rasayil ibn abidin. More than 70 rasayil are collected in imam suyuTi's al-hawi li'l fatawi. There is a volume printed by dar kutub al-ilmiyyah which has 94+ 'books' on various topics titled: 'al majmu'u al-kamil li'l mutun': fiqh, usul al-fiqh, hadith, aqidah, poetry, naHw, prosody, etc. and many of these 'books' are no more than four or five pages. for example, 'Aqayid an-Nasafi' is a mere three pages. Even novelists and poets have their own collections; check collected works of any major author: wells, twain, Iqbal's kulliyat and not to mention [the person/s writing as] Shakespeare. Almost all of Shakespeare's works are found - including his sonnets and poems - in one volume. When a prolific author writes many books, it makes sense to put them in one volume as a collection. it is easy for readers and researchers to find all or most of them in one place. for a bibliophile/librarian, easy to store and retrieve. this does not mean that one volume is ONE book. only a fool would suggest that. Yet, these rasayil have been referred by scholars as 'books' without vehement hair-splitting. Coming back to the rant of some folk who cannot probably even pronounce the names of AlaHadrat's books who attempt to downplay them as 'small' booklets. I would challenge them in a confrontationist tone to try and read these small booklets if they can; because if they have, they wouldn't talk so naively. Only the ignorant shrugs away the diamond in comparison with a rock; just because it is big does not make it valuable - just as the diamond's small size does not make it insignificant. AlaHadrat's fatawa - legal rulings are collected in one place. some legal rulings require lengthy explanations and in my humble opinion anything more than five-ten pages can be classified as a booklet as opposed to 'an essay' or an article. In reality, AlaHadrat issued fatawa from a young age, many of which were never recovered. he also issued lengthy rulings/fatawa and published in the form of booklets giving them exquisite names instead of simply numbering them. in the later part of his life, his students and associates suggested that his fatawa being so insightful and valuable ought to be preserved; it was only then people began to collect the fatawa. when fatawa razwiyah was being edited by AlaHadrat himself, it was only fitting that lengthy fatawa issued as epistles be included under appropriate sections. Even in today's world these epistles are self-contained and are convenient to be published as separate works. for example take the issue of moon-sighting. how many people will buy thirty volumes, each of about 800 pages each to read those two or three epistles? naturally, it makes sense to print them separately and more so for online reading, where flipping pages to browse is not possible. Even the names of his books impart knowledge. Try reading them in the arabic script and if you don't understand the meaning, look it up in a dictionary. in the process, you will learn a lot of other words along with etymology and usage. I am sure there are not many - if there are any - who can understand all the words used in these names without a dictionary.